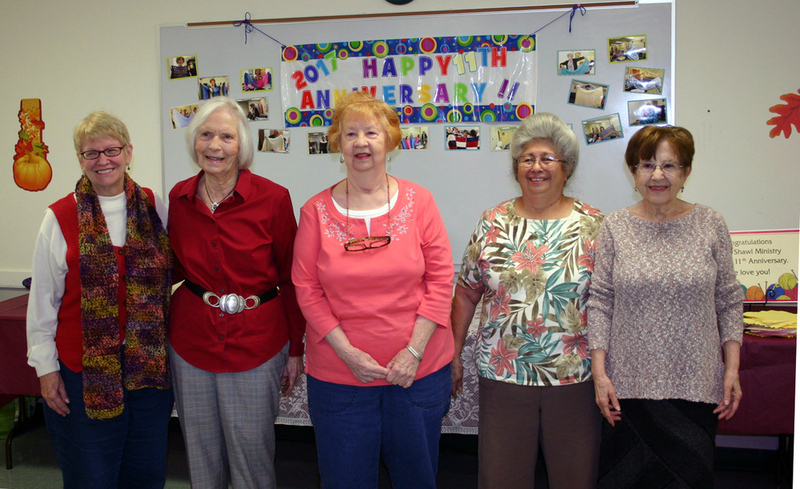 Seven ladies started St. Catherine’s ministry in the fall of 2006 and the group has grown to more than 30. (We also remember in our prayers two of our shawlers who have died.) Prayers for each recipient are knit into their shawl throughout its creation. When completed, the shawl is prayed over by the group and wrapped, along with an individualized prayer gift card and a brochure explaining the ministry. A giver then presents the shawl to its surprised recipient. All involved sense the unconditional embrace of a sheltering, mothering God. Requestors have sent St. Catherine shawls worldwide and throughout the U.S and Texas. One shawl is in a hospice center in Washington state; the wearer, who had no family, died of cancer with his shawl draped over him. The center’s staff was so impressed, they kept his shawl for the comfort of other cancer patients. And so our prayers continue. We now have several partnering sister ministries, one in Indianapolis started by a visitor to our gathering! We are all so blessed. There is no wrong way to create a shawl; it’s the praying that counts. And only the good Lord is perfect! Read more about the national Prayer Shawl ministry here. If you would like to request a shawl for a loved one who would appreciate our prayers, please send an email. Please note, St. Catherine of Siena Catholic Church in Austin, TX does not ship prayer shawls as we use our donated funds to purchase yarn . Requested shawls are picked up in the Community Ministries Office at St. Catherine of Siena Catholic Church, 4800 Convict Hill Road in Austin. You&apos;re welcome to join us! Prayer Shawl Ministry meets every 2nd and 4th Thursday of the month at St. Catherine of Siena Church in the administration building from 12:45-2:00. Join the Prayer Shawlers for prayer and fellowship. This is a wonderful opportunity to share your honed talent or your burgeoning talent with our St. Catherine community. Practiced (we help but we don’t teach) knitters and crocheters, visitors and newcomers are always welcome. We have many patterns to share or bring your favorite and we’ll help you configure it “a hug wide” if needed. Prayer Shawlers receive a Royal Thank You! Happy sounds emanated during a recent shawlers’ gatherings as the joyful ladies received a thank you note from the Duke and Duchess of Cambridge, grateful for the baby blanket sent to them in anticipation of the birth of their third child. St. Catherine&apos;s Prayer Shawl Ministry has sent the royal couple baby blankets for all three of their children. The card is shown below.